Paintings of Mary cradling her newborn son Jesus line the walls of Picturing Mary: Woman, Mother, Idea. This iconic “Madonna and Child” pose, the most prevalent visual representation of the two, was popularized during the 5th century following the Catholic Church’s sanctioning of the cult of Mary as Mother of God. The figures’ position, as well as the iconic shades of blue and red that Mary often wears, captures an expansive definition of motherhood. The Virgin Mary is not only mother to Jesus, but to all humanity. But what does it mean to be a mother? 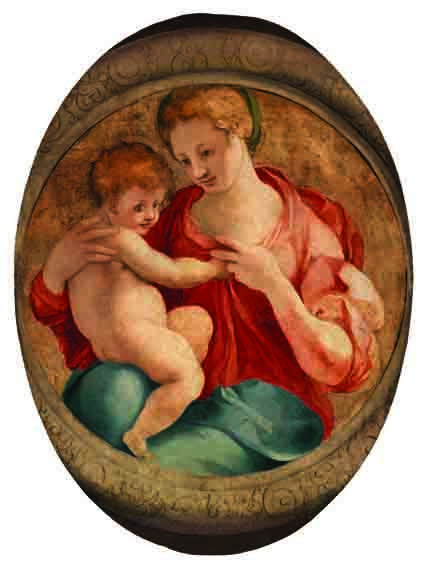 Pontormo’s Madonna and Child (1527) reveals that motherhood involves physical and emotional closeness to one’s child. The large figures of Mary and Jesus dominate the picture plane. As Mary supports her son on her knee, the two figures hold hands and Jesus grabs his mother’s bodice. Their heads are tilted toward each other with tender, loving expressions. These elements both physically connect the Virgin and Jesus and imply the deep-rooted bond of mother and child. Pontormo’s use of this pose, with Mary’s hand supporting her son’s back, affirms her supportive and nurturing nature as a new mother. Here, Mary wears her signature blue cloak with a red shirt underneath. Deeply rooted in Catholic symbolism, the blue of her cloak has been interpreted to represent the Virgin’s purity, symbolize the skies, and label her as an empress, for blue was associated with Byzantine royalty. Her shirt’s red color signifies love, passion, and devotion—all traits connected with motherhood and exemplified by Mary’s presence at the Crucifixion. Like Pontormo’s painting, Madonna and Child (ca. 1450) by the Master of the Winking Eyes underscores Mary’s affectionate temperament and role as a mother. In this jovial scene, Mary tickles her son as her blue veil covers both of their heads. Their joyful expressions and close physical proximity capture the scene’s tenderness while the golden background further encapsulates the lighthearted, playful interaction. By humanistically depicting the Virgin laughing with her baby, the Master of the Winking Eyes portrays Mary as a relatable mother, showcasing her humanity. Her veil, draped over both heads, symbolizes the human nature that Christ inherited from his mother as well as their loving bond. Beyond her role as Mother of God, Mary was often depicted as mother to all mankind. Mother of Mercy (Madonna della Misericordia) (1494) by an unknown artist illustrates this expansive definition of mother. The standing Virgin envelops the faithful beneath her cloak. This Mater Misericordiae or “Mother of Mercy” image type dates back to the 13th century, and it embodies the popular medieval idea of Mary as mother to all believers. The image of Christ over Mary’s womb hints at her elevated nature, and her superhuman size accentuates her importance. Like in the other two paintings, in her role as a mother Mary is a maternal protector. In Picturing Mary, images capture the multifaceted nature of motherhood along with the multifaceted nature of the Mother of God herself. Picturing Mary is on view through April 13 at the National Museum of Women in the Arts. Plan your visit today! The figure of the Virgin Mary has been used in art as an ideal woman, poetic beauty, and perfect mother. Young girls in the Italian renaissance were told to look up to the examples of the saints, particularly the Virgin, to guide their behavior. Her portrayal provides clues to the theology and culture prevalent at the time. An example within Picturing Mary: Woman, Mother, Idea of the Virgin as exemplary mother is Artemisia Gentileschi’s Madonna and Child (1609–10), which shows the Virgin Mary with an exposed breast, nursing her son. This image reveals Renaissance ideas about the exemplary woman and the concern about nourishment and breastfeeding. Earlier images of the Virgin with one exposed breast may have been especially poignant in times when Florence was affected by famines and food shortages. In 14th-century Italian images, the single exposed breast of the Virgin was a frequently defined part of Mary’s body. Viewers would not see her breastfeeding as a moment of exposure, but rather as a moment of nurturing and providing.¹ Between bouts of plague and food shortages in the face of a rapidly increasing population, diet and malnutrition were a considerable concern. The health and nourishment of children, especially a male baby such as Christ, would have struck viewers as an utmost concern. This 17th-century Gentileschi image differs from the common medieval type. The body of the Virgin is clearly formed beneath the fabric of her gown; Christ sits between her knees and her trailing gossamer hair ribbons draw even more attention to her flesh. Her bare feet connote her humility and connection to the earth. Here, Mary is a humble mother who cares for her corporeal, human son by giving him the nourishment of her body. The child’s limbs are chubby, and his pink face suggests that he is healthy, well-fed, and cared for by his attentive mother. Even as Gentileschi was painting this image, concerns about nutrition and breastfeeding within Renaissance culture were numerous. Humanists had rediscovered the antique medical theories of the Greek physician Galen, whose beliefs about reproduction gained attention. Rather than contributing to the matter or spirit of the child (this was attributed to the father only), Galen believed that the mother’s main contribution came from the breast milk that a child consumed. Further, he believed that the breast milk was heated, purified menstrual matter, and that it contained properties that could shape the personality and physical appearance of the child. An infant’s proper consumption of milk was seen as important. For many upper-class Renaissance families, this concern about nutrition was directed toward finding a suitable wet-nurse, as her breast milk would be ingested. No matter what, people were concerned about the baby imbibing good traits rather than monstrous ones. Gentileschi’s Mary is obviously an elite woman, from her clothing, but the fact that she’s nursing her own baby could be seen as another sign of humility. As Christ is nursed here by his mother, he not only imbibes her good qualities and exemplary characteristics, but her humanity. The image and their interaction would remind the viewer of Christ’s sacrificial flesh, and the Virgin’s own part in his passion. Miles, Margaret. “The Virgin’s One Bare Breast: Nudiity, Gender, and Religious Meaning in Tuscan Early Renaissance Culture.” In The Expanding Discourse: Feminism and Art History, by Norma and Mary D. Garrard Bourde. Westview Press, 1992. Impress your friends with five fast facts about Italian artist Artemisia Gentileschi (Rome, 1593–Naples? 1656), whose work is currently on view at NMWA in Picturing Mary. Gentileschi completed several of her best-known works, including Madonna and Child (Madonna col Bambino) (1609–1610) and Susanna and the Elders (1610) before her 18th birthday. Check out Madonna and Child at NMWA in Picturing Mary: Woman, Mother, Idea, December 5, 2014–April 12, 2015. Considered the only female artist to follow the tenets of Caravaggism (after Caravaggio), Gentileschi skillfully depicted extreme contrast between light and dark in works like Judith and Holofernes. This ability to evoke drama caught the eye of wealthy patrons including King Philip II (Spain) and Charles I (England). Artemisia trained and worked side-by-side with her father, Orazio, in his painting studio. Owing to their similar aesthetic and entwined professional relationship, scholars today disagree on the attributions of many works from the Gentileschi workshop. Gentileschi led a progressive life for a woman of her time by sustaining a career independent of male oversight. Finding a kindred spirit in the unconventional Galileo, she befriended the famed astronomer while living in Florence and maintained their relationship through letter-writing. Gentileschi lived and worked in Florence, Naples, London, and Rome. Gentileschi’s legacy lives on in these cities, all of which are home to works by her hand. Stateside, you can see her paintings at the Metropolitan Museum of Art, Columbus Museum of Art, and Detroit Institute of Arts.